At noon (EDT) newly elected Pope Francis and 114 cardinals electors celebrated the Missa pro Ecclesiae (Mass for the Church) at Sistine Chapel. 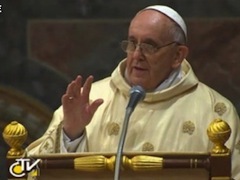 During the Mass he delivered his first, yet informal, homily as Pontifex. The seven minute speech in Italian wasn’t prepared earlier. Holy Father used his notes only. Below is the translation of his homily from Vatican Radio. We Cannot Profess Christ Without the Cross | Creo en Dios!